University Medical has recently launched a fabulous alternative to plastic surgery and the endless face creams that promise results and never deliver. This new system replenishes Hyaluronic Acid in the skin, through a patch that is worn under and on the side of eyes while you relax or while you work. The procedure is extremely easy, completely painless and can be performed at home in just 40 minutes. The WrinkleMD Anti-Aging iPod System replenishes skin with Hyaluronic Acid to help fill fine lines and wrinkles. Hyaluronic Acid, the same thing dermatologists use to fill lines and wrinkles, naturally decreases as we age leaving skin prone to wrinkles. WrinkleMD's patented Ion Infusion technology uses a microprocessor to deliver the Hyaluronic Acid back into skin in just forty minutes one time per week. Start with clean, dry skin. Wipe skin prep applicator gently around eye area and let dry. Attach eye patches to the Activator Pod buds and then apply to skin one at a time. Wait 40 minutes, then remove the patches from skin to reveal an immediate difference. Ok...so this cool little thing is like an iPod for your eyes. After using WrinkleMD the first time, I couldn't wait to try it out again. I immediately noticed a difference in my skin. I have used it every week now for four weeks and I love it. I like how easy it is to apply and how it can be worn no matter what I am doing. Plus, there is no mess to clean up and no pain at all. Just a slight tingling sensation while wearing the device but its not bothersome. After 40 minutes you remove the pads and put the WrinkleMD back into its pouch. There is no discoloration on the skin or anything. It's fabulous! I also really like the eye serum C that comes with the kit. It's well worth the price and it's a great buy for anyone considering surgery or expensive wrinkle creams. I'm definitely sold! The WrinkleMD Quick Start System comes with 6 Pair Eye Patch Treatments, 6 Skin Prep Wipes and 1 Activator Pod + Pouch. 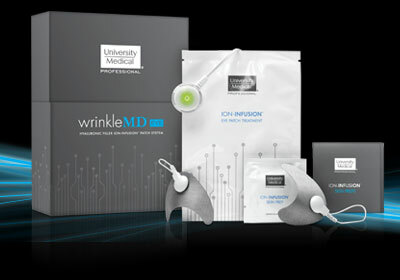 The WrinkleMD Deluxe-Kit Eye System is available at UniversityMedical.com for $129. Disclosure: I was not paid to write this post. All opinions are my own. I did receive the products mentioned above to facilitate my review. Have a comment or suggestion? We would love to hear it! This policy is valid from 01 September 2010. This blog is written and edited by T. Booth. For questions about this blog, please contact tiffanybc@outlook.com. The owner(s) of this blog may be compensated from time-to-time to provide opinion on products, services, websites and various other topics. That content, advertising space or post may not always be identified as paid or sponsored content. Even though the owner(s) of this blog receives compensation for our posts or advertisements, we always give our honest opinions, findings, beliefs, or experiences on those topics or products. The views and opinions expressed on this blog are purely the bloggers' own. Any product claim, statistic, quote or other representation about a product or service should be verified with the manufacturer, provider or party in question.